Perkins, whose recent appointment to the Louisiana Law Enforcement Commission by Governor Bobby Jindal sparked national outrage, may be best known as the leader of an organization the Southern Poverty Law Center has listed as a “hate group,” a label that seems more than fitting when one considers Perkins’s and the FRC’s long track record of homophobia, intolerance, and bigotry. 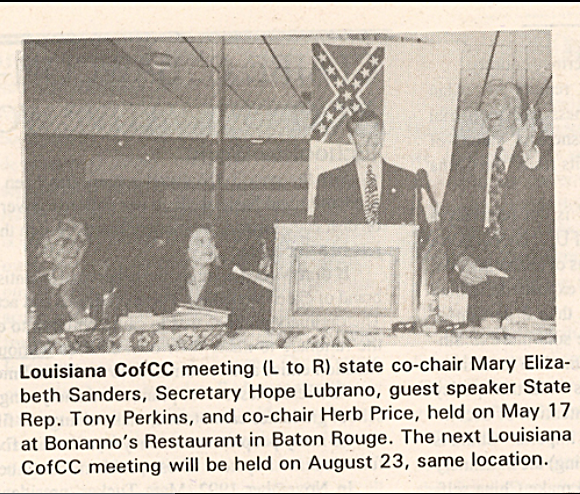 For many in Louisiana, Tony Perkins’s association with a “hate group” is utterly unsurprising. In 1996, while managing Woody Jenkins’s campaign for U.S. Senate, Perkins paid David Duke, the former Klansman, $82,500 for his mailing list; five years later, Perkins spoke before a group of white supremacists. Perkins has never denied that he paid for Duke’s mailing list (the campaign was fined for ethics violations); instead, he’s suggested, incredulously, that he didn’t know whose list it was. And he’s never denied that he spoke to a well-known white nationalist organization in 2001 (there is photographic proof); instead, he’s suggested, incredulously, that he didn’t know what organization it was. A couple of weeks ago, I posted about Tony Perkins’s appointment to the Louisiana Law Enforcement Commission. I reported that Perkins had only been recently appointed. Well, it turns out, I was wrong. Governor Jindal appointed Perkins way back in April, but both Jindal and Perkins kept the appointment quiet. And likely for a good reason. As it turns out, the only reason Perkins’s appointment was reported, months later, is because his old friend Woody Jenkins couldn’t help himself; he congratulated Perkins on his website. A few days later (and despite the fact that the appointment had actually been made months ago), the story made national news. To be sure, members of the Louisiana Law Enforcement Commission possess no real authority. It’s a joke. It’s patronage. It’s an attempt by Jindal to help Perkins repair part of his resume, specifically the part where Perkins was suspended from duty as a cop. Truth be told, Perkins likely won’t even show up for the meetings. When he was on the Louisiana Commission on Marriage and Families, he skipped out, and as a board member of Louisiana College, Perkins has been notoriously derelict. Perkins said the Southern Poverty Law Center has a cozy relationship with the U.S. Department of Justice and leverages that connection to intimidate local school boards into adopting pro-homosexuality policies. He said the center uses similar tactics with local law enforcement. When Perkins refers to local school boards “adopting pro-homosexuality polices,” what he means, actually, is that duly-elected representatives are implementing and enforcing policies that prohibit school bullying. Perkins calls himself a Christian; he attempts to pass himself off as some sort of champion of family values, but at the end of the day, no matter how you cut it, Tony Perkins believes our schools should ignore the undeniable fact that gay and lesbian children are being bullied into suicide. For Perkins, whenever a school board passes a policy that promotes common decency, tolerance, and empathy, it is somehow infringing on his right to be an intolerant bigot who cloaks his antipathy in the language of religion. 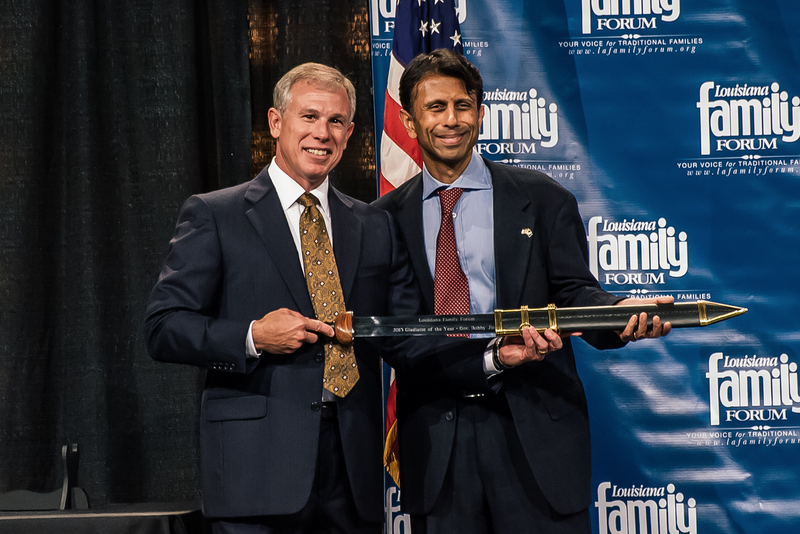 Tony Perkins and his protege Gene Mills, the current leader of the Louisiana Family Forum (an organization founded by Perkins), have spent millions of dollars and the last fifteen years of their lives obsessing over homosexuality, even arguing that laws protecting gay and lesbian children from hateful, targeted, and systemic bullying would somehow “criminalize” Christianity. And when they aren’t obsessing over homosexuality, pretending as if marriage equality poses some type of existential threat to national security, they are fighting against science. You don’t have to take my word for it. Tony Perkins has a nationally syndicated talk radio show. (Either way, if your religion instructs you to reject science, if the theory of evolution somehow shatters your self-worth, if you think God would never allow climate change, that’s awesome. But please stop asking Americans to adopt your religious beliefs as law or policy). I was born and raised in a Christian family, and I’ve studied religion for my entire life. But I have never understood how anyone could be convinced by people like Tony Perkins or Gene Mills. I don’t even remotely recognize their militant and intolerant brand of Christianity. Maybe it’s because I went to a nice little Methodist church that was led by a gentle, brilliant man who liked to talk about art and culture, not about hell and sin. Regardless, I think Tony Perkins and Gene Mills and those legislators who kowtow, every single year, to the narrow-minded whims of the Louisiana Family Forum have done more to divide the people of Louisiana than any single election, any storm, or any spill. I’m not sure who, exactly, is encouraging Tony Perkins to run for Congress. Maybe no one is. Maybe he just wanted to float his name in order to help preserve his Louisiana bona fides. It really doesn’t matter. PS: There’s a reason I bolded the part of Perkins’s statement about being “closer to home;” he already lives in Washington, D.C.
Prev LA 5th: Who Is Responsible for This Illegal Robocall? These idiotic morons who use a claim to be “Christian” are beyond disgusting. Thank you for exposing this one. We all need this sort of information and we must never support such bigotry ever. When Perkins says of the Southern Poverty Law Center, “This is a very dangerous group,” he means *dangerous* to bigots like him and his group. If given the chance to go back in time and kill Hitler before he did what he did, most people would do it. Somebody please just permanently shut this rancid non-human Nazi up.